Dogs love Smith Rock, just like you. Sometimes we are so caught up in our own thoughts we forget they are having their own version of life's dramas. 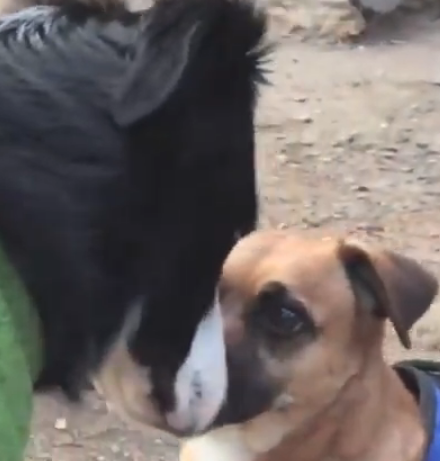 Riggins, a lovable Border Collie mix, let us in on his recent day at the park, with this guest post and video of his innermost thoughts on his first trip back to Smith after a traumatic breakup with his girlfriend, Sofie. Life Begins Again, Four Steps at a Time. That magical day when we first met. Sofie and I never even exchanged barks. Our eyes locked after a quick sniff and I was hooked. Fortunately, the leashes we on both went in the same direction across the bridge and around the River Trail. Apparently our humans were meeting to go climbing in The Dihedrals! After a quick fill-up at the water fountain we set off in the lead of the pack, our tails touching briefly each time we had to drop to single file to let others come down the trail toward us. Sometimes other dogs greeted us, but we were oblivious. We only wanted to get to the climb so we could hang together. The rest of the day as our humans traded off leash duties at the base of the climb, we were petted, fed, and snuck in some nuzzling time together. We were ecstatic when we heard them making plans to meet all week for different climbs. They never went to the park without us, so we were destined to be together. Or so I thought. After an amazing week at The Monument Area, The Gorge, and the Northern Point, we ended up back at The Dihedrals. Then HE showed up. His swagger and confidence were noticed by all, including Sofie. Apparently, his human was attracted to Sofie's, and that was that. He managed to move in on Sofie with ease and she seemed hypnotized. She barely noticed me after that as I slunk out of the park, my heart shattered. It's been a few months. With the lack of snow this year, climbing in December was now possible. Since me and my human were away in the summer and she was busy mountain biking after that, this was our first trip back to Smith Rock since THAT day. To say I was nervous was an understatement. What happened next made me face that fear.